HDA TEAM : Hugh Dutton, Mitsu Edwards, Andrea Pfadler, Riccardo Perna, Giovanni Lunelli, Gaetan Kohler. 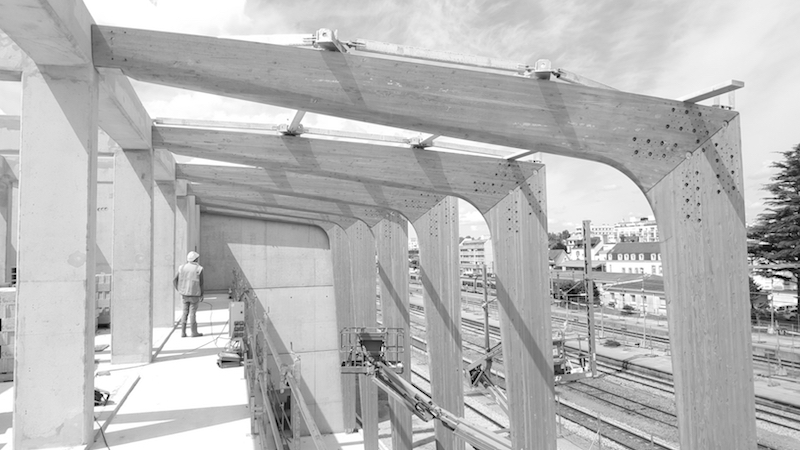 AREP’s Gare et Connexions appointed HDA with the main structural work and façades of the reconstruction of the Lorient TGV station. 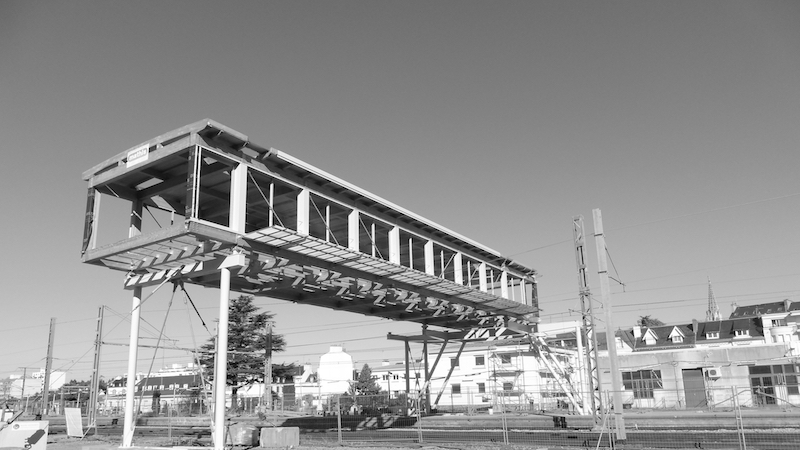 The brief included the construction of a new passenger reception building and an elevated walkway over the railway tracks. 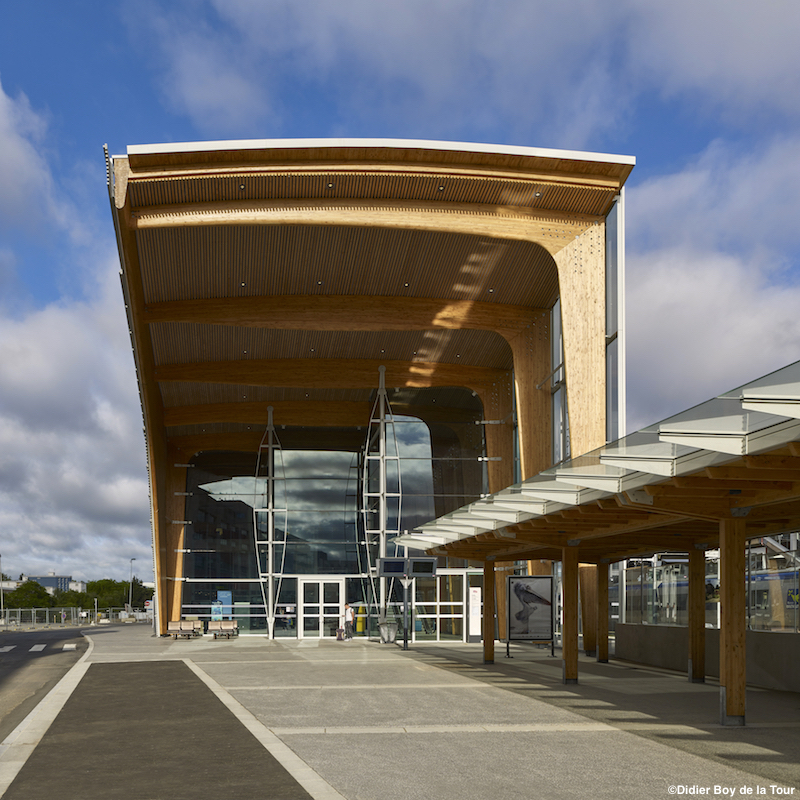 The shape of the building as well as the geometry and materiality of the structure and cladding were inspired by the local Breton fishing boats. 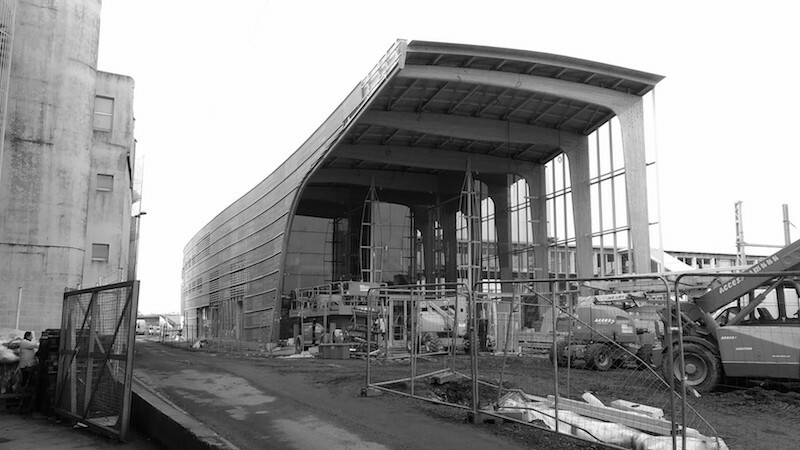 The basically rectangular form of the building is softened with gently curving roof and facades consistent with the maritime design reference. The entire structure is of wood. 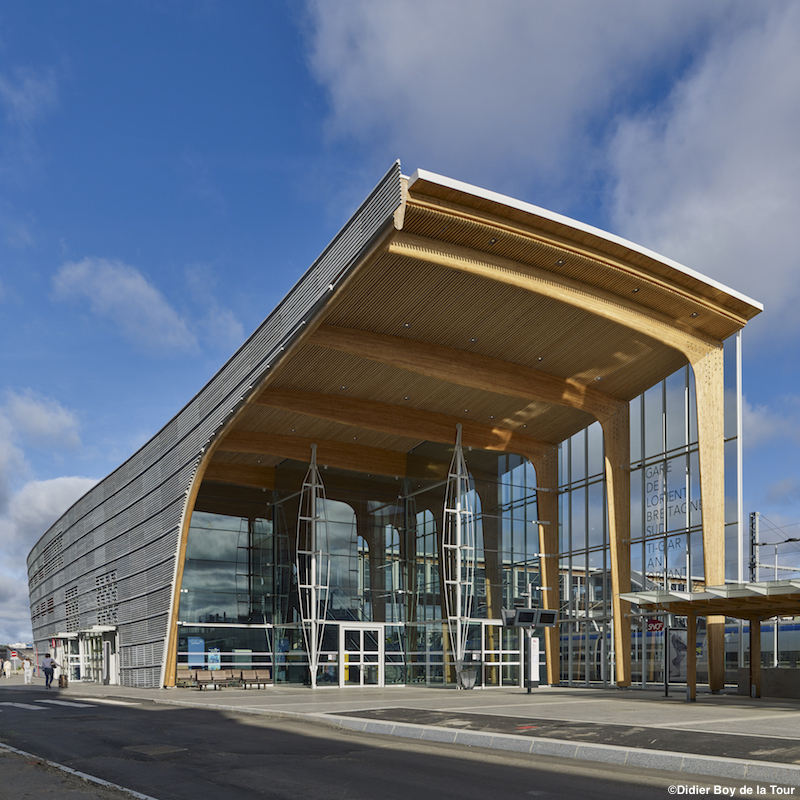 The passenger building is made of laminated timber portal frames with ridge and secondary beams in solid timber and braced with plywood stressed skin panels which also cover the structure and support the insulation layers of the roof. 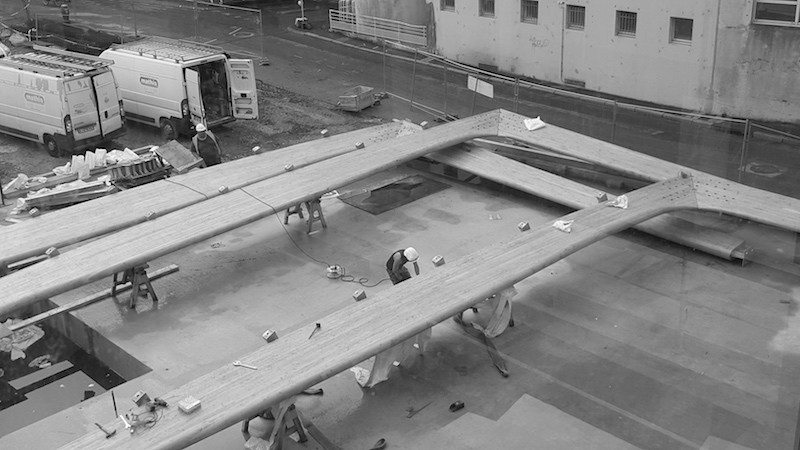 The shape of each of the portal frames is slightly different, as they respond to the bending forces they resist. 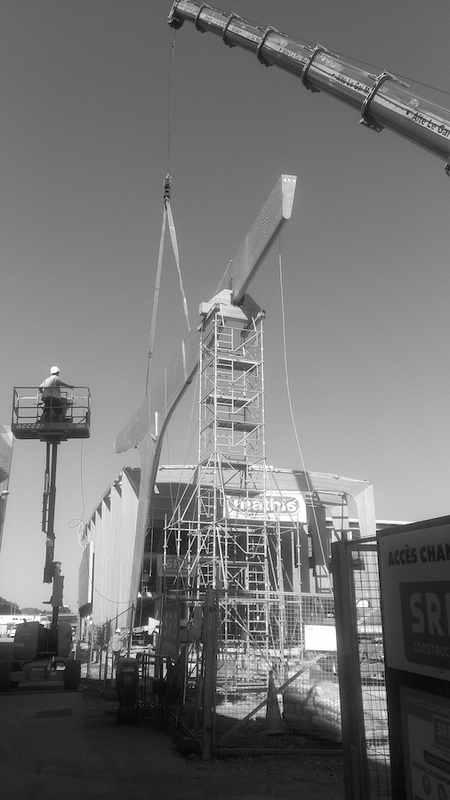 Cantilevering end portals at the entrance are different from typical ones in the main body of the building. 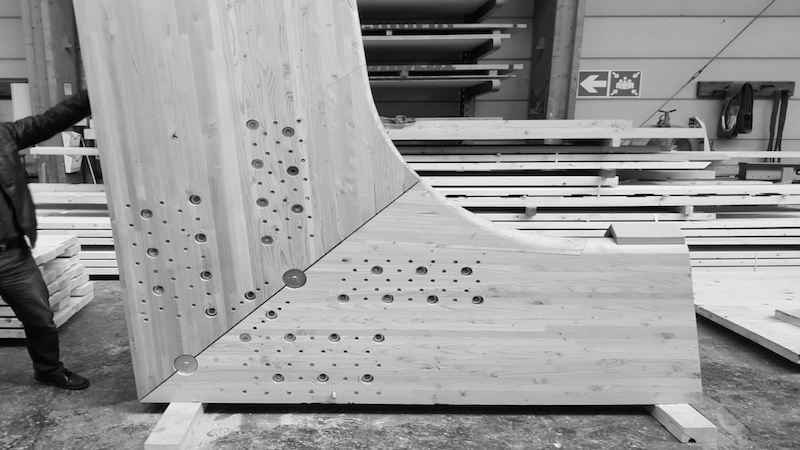 This generates a gently varying visual curvature which gives a unique character to the building. 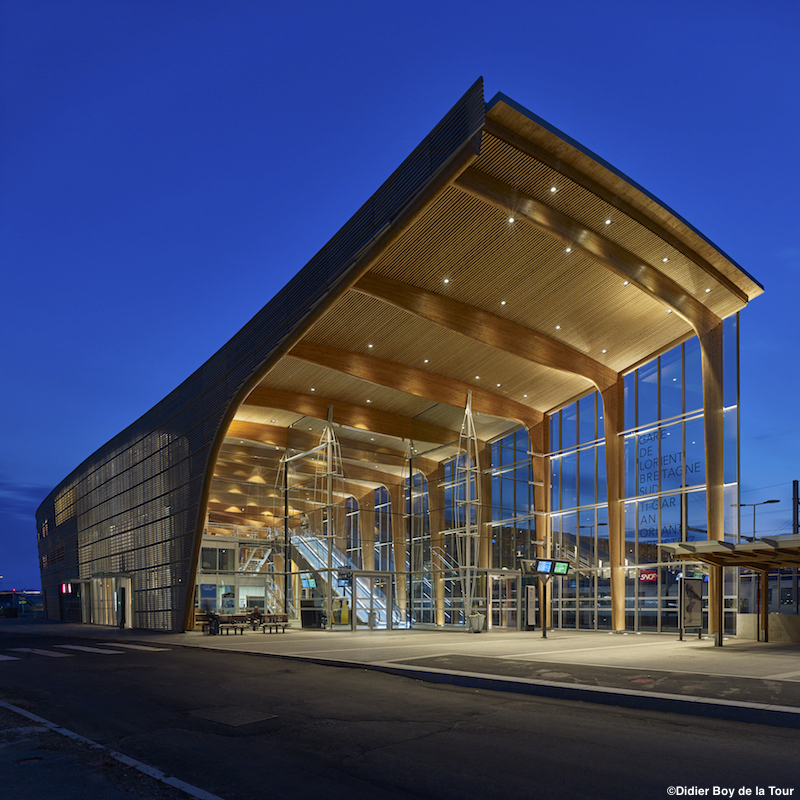 In the dramatic cantilevering entrance, the portal frames join to a primary ‘boomerang’ piece which provides a bold expression recalling maritime timber framing that is an appropriate expression of the town. 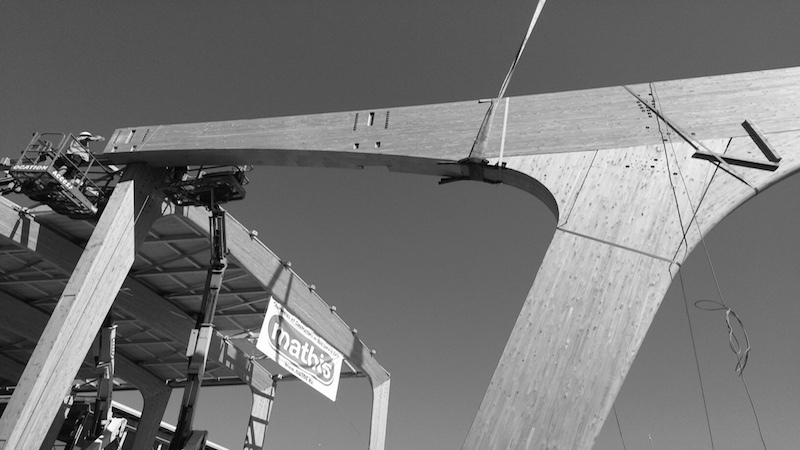 The elevated walkway is a composite mix of timber compression members, and steel tensile elements. The walkways are supported on steel tubular columns and are stabilized laterally by sloping diagonals that follow the escalator and stair access routes down to the platforms. 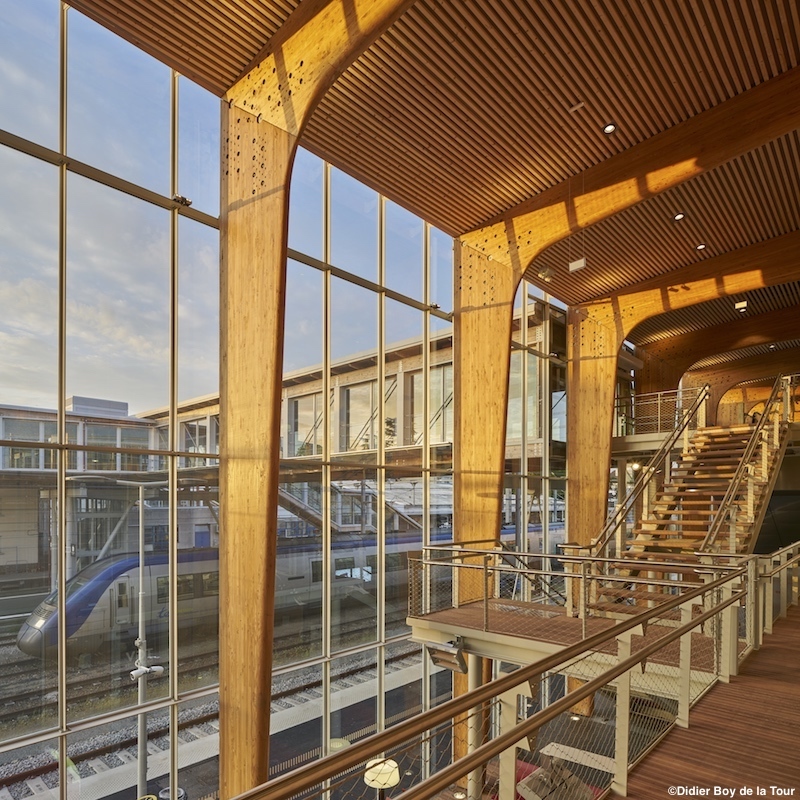 The timber framing is covered with standing seam aluminium sheeting and the façade to the railway tracks is in a minimal glazing skin. 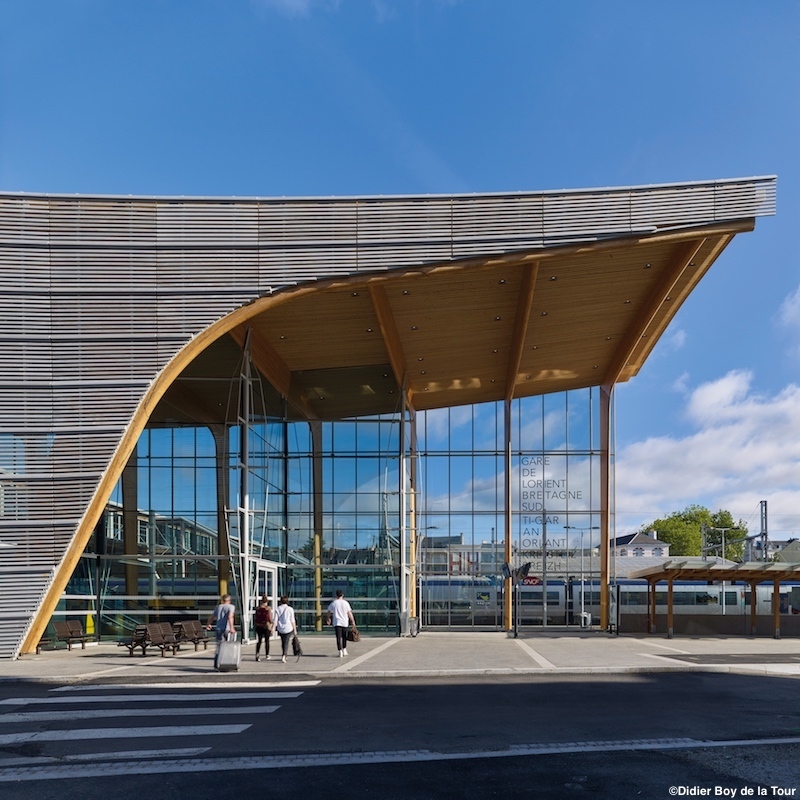 The urban façade of the building is clad in fibre reinforced concrete in front of a bold red waterproofing skin, recalling the traditional timber clinker boat hulls. 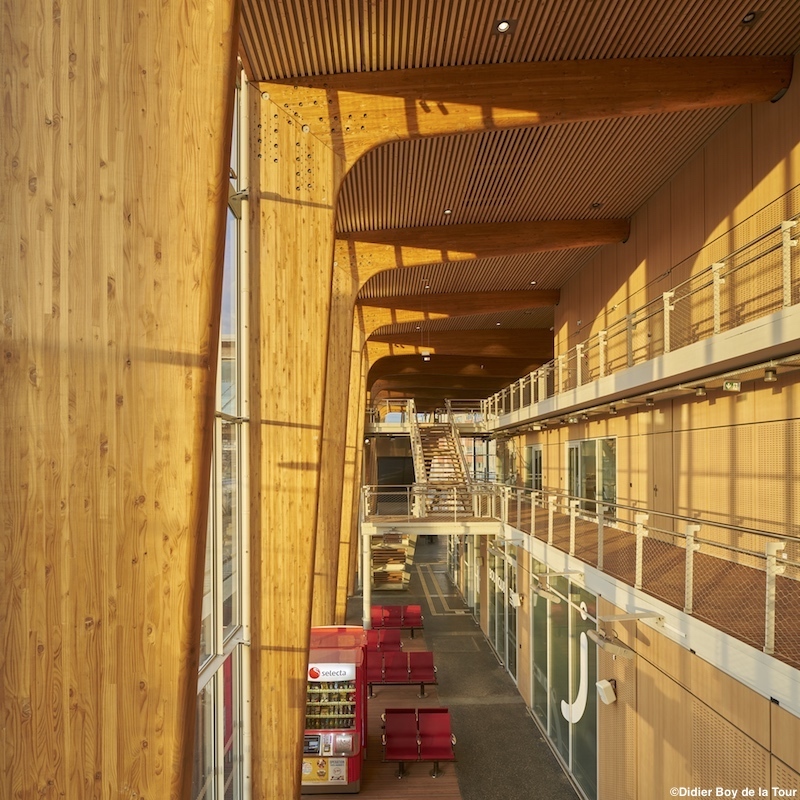 The ceiling consists of a continuous wooden lattice which floats above the portal frames and emphasizes the convergent forms of the building.